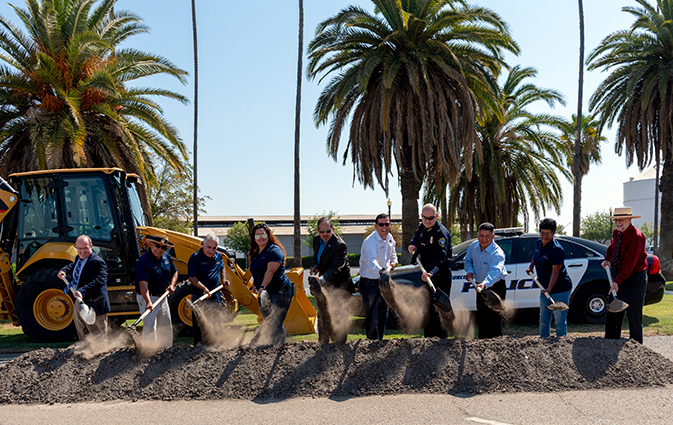 City of Corcoran breaks ground on the TETER-designed new Police Headquarters. Originally published by THE SENTINEL on August 18, 2018. CORCORAN – A plan that has been 10 years in the making is finally coming to fruition. By this time next year, Corcoran Police officers will have a brand new 10,400 square-foot facility and will no longer have to remodel closets to fit more office spaces. The new facility is made possible by the $8.7 million in state money that was recently awarded to fund new public safety facilities for the Corcoran Police Department and Kings County Sheriff’s Office. The Corcoran Police Department received $1.7 million of that money to fund a new facility. 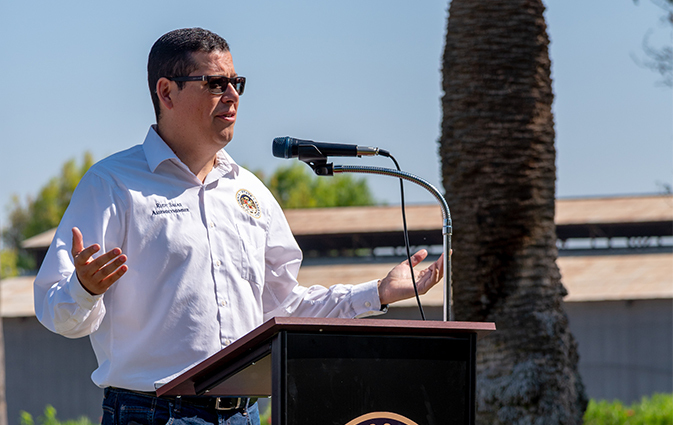 In 2015, Assemblyman Rudy Salas (D-Bakersfield) secured $5 million for public safety infrastructure in Kings County, including $3.82 million dollars for a new police facility in Corcoran. 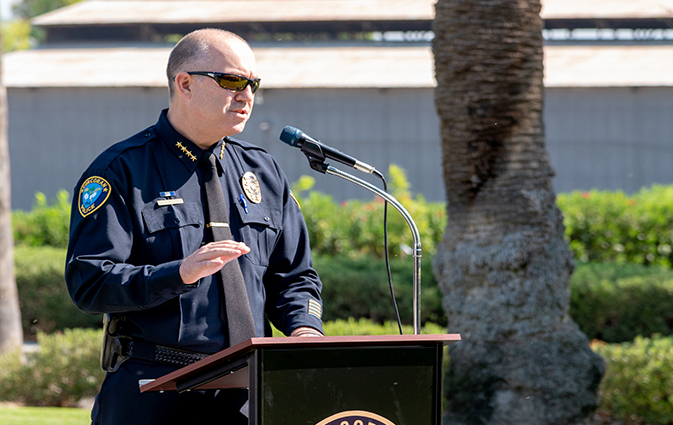 The city had been working for over three years to secure the remaining funding necessary to replace the current 4,000 square-foot Corcoran Police Department facility that is over 75 years old. With the additional funding secured this year, the project now is fully funded. The new building, which will be located on the corner of Hannah and Otis avenues in Corcoran, will bring all the department’s operations into one building and will include a temporary holding facility, an emergency operation center that can also be used as a community meeting space or training area, a fitness room for officers and staff, and a fully-enclosed secure entryway to improve the safety of officers and prisoners. “It has a lot of good components that I think are going to benefit the city for a long, long time,” Corcoran Mayor Ray Lerma said, jokingly adding that he expects the building to last the city for another 75 years. Corcoran Mayor Ray Lerma thanks everyone involved with securing money for the new Police Department Building. City officials also hope the new facility will improve the public’s experience at the department, in turn promoting positive community engagement and interaction. Along with Lerma, several people who were key factors in securing the funding spoke at the facility’s groundbreaking ceremony, including Salas, Police Chief Reuben Shortnacy, Corcoran City Manager Kindon Meik, Kings County Board of Supervisors chairman Richard Valle and Chuck Jelloian from CrisCom Company. One thing all the speakers agreed upon was that securing this funding was a team effort that included tenacious pressure form police, city, county, and state officials. 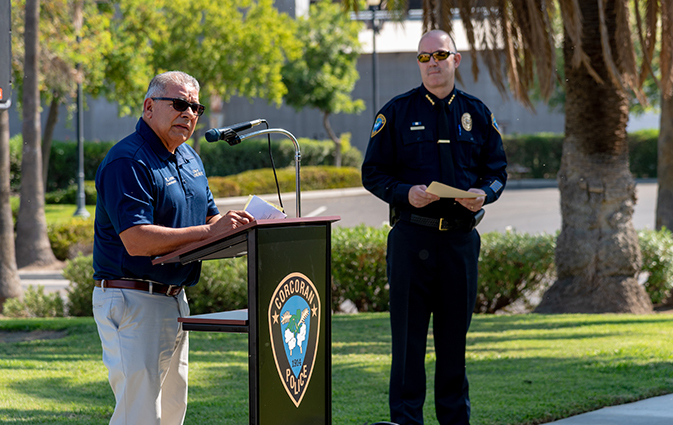 Assemblyman Rudy Salas (D-Bakersfield) speaks at the groundbreaking ceremonies for the new Corcoran Police Department facility. The new building, which will fittingly be addressed at 911 Hanna Avenue in Corcoran, is expected to be completed March 2019. “This is just one more thing to help us provide the level of service that this community expects, and what they deserve.” Shortnancy said. Corcoran Police Chief Reuben Shortnacy talks about the planned Corcoran Police Department facility.